Scientists have long known that cancer can hijack a cell's existing regulatory circuitry and transform healthy cells into deadly malignancies. But a new discovery from UC San Francisco demonstrates that cancer is more than just a mutineer that seizes control of the cell's administrative operations—it's also a clever engineer, capable of constructing entirely new disease-promoting networks out of raw materials readily available in the cell. In a study published Nov. 5 in Nature Medicine, UCSF researchers show that cancer can make edits to run-of-the-mill RNA sequences to produce what the researchers dubbed "oncRNAs"—a previously unknown class of regulatory molecules that can turn a relatively meek malignancy into a far more aggressive, far deadlier disease. OncRNAs may also provide clinicians with an important tool for diagnosing cancer. Because they were found in blood drawn from breast cancer patients, the researchers believe oncRNAs may one day allow clinicians to perform non-invasive "liquid biopsies" that require nothing more than a blood sample to diagnose and characterize a patient's unique malignancy. Though scientists have long known that cancer cells promote their continued survival by commandeering and repurposing the cell's normal regulatory machinery, UCSF researchers Hani Goodarzi, Ph.D., postdoctoral fellow, and a member of Hellen Diller Family Comprehensive Cancer Center, Lisa Fish, Ph.D., and HHMI Medical Fellow Steven Zhang wondered whether malignancies might also be able to go a step further, engineering entirely new regulatory pathways that fall outside the purview of normal cells. According to Goodarzi, senior author of the new paper and an assistant professor in the department of biochemistry and biophysics, this would be possible if two criteria were met. First, cancer cells would need a pool of biomolecules that don't exist in normal cells; these molecules would exist only as an emergent property of cancer, materializing after the onset of malignancy. Second, these molecules would have to have regulatory potential—cancer would have to be able to use them to execute tasks not carried out in healthy cells. While studying small RNAs (sRNAs)—a class of RNA that regulates gene activity rather than coding for functional proteins—the researchers identified candidates that appeared to satisfy these criteria: potential regulatory molecules seen in cancerous cells that were largely absent in healthy tissue. "Initially we were looking at small RNAs known to be found in cancer cells," Goodarzi said. "As I was poring over that data, I would now and then notice small RNAs that scientists in the field had never observed or characterized. We didn't know what they were." Goodarzi termed these molecules "orphan non-coding RNAs," or oncRNAs. To ensure that oncRNAs were truly unique to cancer and not an experimental artifact, the researchers performed a systematic search for them in three types of breast cancer. They identified 201 oncRNAs that were present in cancer but absent from normal mammary cells. Though this confirmed that oncRNAs satisfied one of Goodarzi's criteria, it didn't explain their biological role. To deduce this, the researchers looked for oncRNAs that were abundant in highly metastatic breast cancers. One in particular stood out—an oncRNA just 45 genetic "letters" long that the researchers named T3p. High levels of T3p were strongly correlated with advanced stage breast cancer and lower patient survival rates. But why? T3p didn't promote tumor growth. In fact, when the researchers inactivated T3p, cancer cells continued to grow and divide as before. What makes cancer deadly, however, isn't usually its growth rate—it's how effectively it spreads. "Metastasis is the tail end of cancer progression and it's a distinct component of the disease," Goodarzi explained. 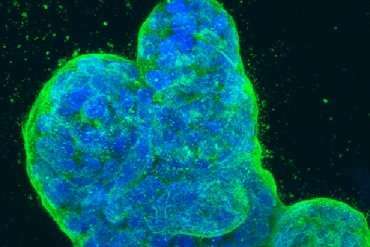 "It can be very much independent of what happens in tumorigenesis, which is largely driven by tumor growth. Metastasis is defined by other features, like invasiveness and colonization, which fall outside of what it takes for the tumor to grow." T3p, it turns out, is a metastatic gas pedal—it makes cancer more aggressive and accelerates the rate at which it spreads. Without T3p, cancer's ability to invade nearby tissue was seen to be significantly diminished in the new research. By contrast, when the scientists injected cancer cells with inactivated T3p into mice, they found fewer metastatic tumors when compared to mice that received cancer cells in which T3p was active. Surprisingly, T3p was found to have the same sequence as the tail end of a gene called TERC, which encodes the RNA component of the cell's telomere-manufacturing machinery. Telomeres—repetitive DNA sequences found at each end of a chromosome—function much like aglets on shoe laces, protecting chromosomes from deteriorating when cells divide. Telomere dysfunction has been implicated in a variety of age-related diseases and in cancer. The sequence similarity between T3p and TERC was no coincidence. The researchers demonstrated that TERC is the raw material from which T3p is produced. Because gene activity is dysregulated in cancer, cancer produces more TERC RNA than it's supposed to. This allows special proteins that interact with RNA to latch onto this excess TERC and snip off its tail to produce T3p. Once liberated from its TERC precursor, T3p insinuates itself into the cell's regulatory machinery and, in doing so, establishes a completely new regulatory network. In the context of breast cancer, for example, T3p was shown to interact with RISC—a cellular machine that recruits small RNAs known as microRNAs (miRNAs) to suppress gene activity. T3p prevents RISC from recruiting the miRNAs that limit the activity of metastasis-promoting genes, thus ensuring that these genes are abnormally active and drive the cancer's continued progression. Though oncRNAs are fabricated in cancer cells, they're not captives. In fact, they're drifters. The researchers found that oncRNAs could escape from cancer cells in exosomes—tiny sub-cellular transporters that are loaded with molecular cargo and bud from the cell, and which can often be found circulating in blood. The researchers were able to find T3p and other oncRNAs in blood serum drawn from breast cancer patients. Because exosomes are known to transport molecular freight between cells, it's possible that oncRNAs can be delivered to cells where they're not being manufactured, driving those cells towards metastasis. However, oncRNAs in exosomes may also serve as a powerful new diagnostic marker that could be detected in liquid biopsies. "Conventional analog markers for cancer were based on looking at the activity levels of genes that are known to be dysregulated in the disease," Goodarzi said. "OncRNAs improve on this by providing a digital barcode for the identity of the cancer cell. With a digital marker, we can diagnose the disease based simply on the marker's presence or absence in a tissue sample or in blood. If it's present we can learn something about the underlying tumor it was released from. One day, exosomes containing orphan RNAs floating around in blood may allow doctors to detect early-stage cancers that elude other diagnostic methods."